Bedrich Smetana was born in Litomysl or Leitomischl, Czechoslovakia, in March 2, 1824. He was a gifted child prodigy; played in a string quartet at the age of five, and debuted as a pianist a year after. His father was a brewer and music lover who gave Bedrich much musical traning. He received a great blow when he was in Prague in 1843 because nobody was interested to know him or his playing. He then yearned for knowledge of music literature and studied hard, succeeded in becoming a teacher but failed to be recognised as a virtuoso performer. He stepped up his compositional efforts, which was encouraged profoundly by Liszt. In 1848, Smetana composed Six Characteristic Compositions for the solo piano and dedicated it to Liszt. The composer wrote this in one of the critical period in his life as he was unable to make a living in Prague. He was faced with complete ruin because his father refused to send him financial aid (which he himself refused to accept too). The 24 year old Smetana had no choice but to write to Liszt who was in Weimar at that time seeking for help. He needed 400 gold coins to keep his body and soul together in one piece. In the same letter, Smetana attached the manuscript of the Six Characteristic Composition hoping that Liszt would accept his dedication and have them published in Germany. He also accepted the dedication and arranged for the work to be published by the Leipzig firm of Franz Kistner. Although Liszt could not help and the publisher did not pay Smetana (an unknown newcomer) any fee, Liszt's gesture marked a decisive turning point in Smetana's career. The young and terribly under-estimated composer now felt honoured by having received the warmest praise he could have possibly earned. At that point, he became more self-confident and mobilized himself into the battle for recognition with renewed vigour and perseverence. Years later, when a conductor, in Liszt's presence, condescendingly told Smetana that his 'race' produce good violinist but not a single composer to be noted. Liszt sat down at the piano and played from memory the music that Smetana had sent to him, telling the conductor, "Here is a composer with genuine Czech heart, an artist by the grace of God"
Revolutions after revolutions shook Bohemia and the rest of Europe. His experience on the barricades, and the subsequent brutal supression of the rebellion by the Austrians, began to change his heart and mind on this subject. Smetana's patriotic feelings was awakened by the Prague Revolution (June 11) which collapsed, German remained the official language for Bohemia. He could not even write his native tongue, conducting his business and composing in German as we can see in The Moldau. He remained unaware of how important it would become for him to master the Czech language in Bohemia and how seriously handicapped he would be until he did so. The next year he married Katerina Kolerova, whom for several years had been his pupil. Their marriage was fraught with tradegy. Only one of their four children survived infancy, and Katerina herself developed tuberculosis in 1855. In 1856, after years of desperate subsistence living in Prague, he finally secured a conductorship in Sweden, where he also managed to secure some success as a pianist. His orchestral works of this period do not yet reflect his nationalism (the tone poems Richard III and Wallenstein's Camp for example are not based on Czech subjects) but perhaps the separation from his home country had an effect, for his first attempt at writing a letter in Czech dates from this year. His wife died in 1859, and he remarried, then two years later returned to his native land, where political tension had diminished and the artistic climate had improved. It was then on that he made a great effort to improve his knowledge of Czech. In 1866 he wrote an opera, The Brandenburgers In Bohemia which was his first work based on national themes. Its premier in 1866, was not very sucessful partly because people did not admire him much and also the new political tension brought on by the Austro-Prussian War. The tension of war shadowed the success of Smetana's second opera The Bartered Bride which was to become his most cherished work for the stage. War shooed Smetana away from the city for a month but when he returned, The Bartered Bride all of a sudden found it's audience and immediately became a popular work. By 1952, the Prague National Theater had given the comic opera more than 1000 performances. In the remaining years of his life Smetana wrote six more operas, all on national subjects. Though all were sucessful with the public, the Austrian-controlled opera establishment continued to cause difficulties. Sadly but true, his health started to deteriorate and his hearing capability declined. Upon completing Libuse, Smetana began planning for a new piece of work. This work became known as the cycle of six symphonic poems Mà Vlast. While composing the cycle, he was troubled by the tinnitus which accompanied his deafness. The high-pitched whistling he heard in one ear was reenacted in his autobiographical string quartet From My Life, last movement Vivace. All medical attempts to cure his illness which costed him a lot of money remained vain. By 1874, he was completely deaf. Sharing the bitter fate of Beethoven. He spent some of his last years (before being sent to mental asylum) quietly in the country, where he lived with his daughter and second wife. His powers of invention never deserted him until the end. His works reflect the lilting character of his homeland and are harmonically and structurally influenced by the music of Liszt and Berlioz. Easy to follow, and nice to the ear. It is very unfortunate that his other operas are little known outside his homeland, for they contain much great music. He is also noted as the real founder of Czech music; a direct musical forerunner of Dvoràk, Suk, Janacek and Martinu and the many other fine composers that the tiny country has produced. Smetana was prolific till the end of his life. His last days were spent in a mental asylum cause by the ill health. He was seriously ill in 1882 and again in 1883. 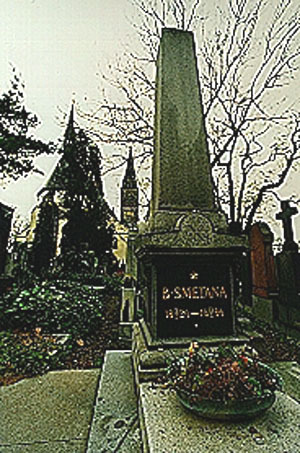 Smetana was taken to the Prague asylum on April 23, 1884 and died there in the afternoon of May 12. He was buried in the cemetary at Vysehrad in Prague. Copyright � 1997 by Khor Chin Yang. All rights reserved.